Which US City Has the Worst Drivers: No Weather Variable? A few days ago, there was an article on Slate that claimed to investigate which US city had the worst drivers. I thought the article was interesting as it’s probably something that everyone has an opinion on. That is, we all think that we know where the worst drivers in the US live. After reading the article, I was surprised — thoroughly — that there wasn’t a mention of weather. Having grown up in Canada, (near Toronto), I am absolutely used to driving in snow and other forms of precipitation. After having lived in 4 different US states (and spending time in 31 others), I feel supremely confident in saying that not everyone is comfortable driving in forms of precipitation. While not an extraordinary revelation by any means, it still seems important. I had to read through the article a couple of times because I didn’t believe there was no mention of ice, snow, snain, or something else related. Weather absolutely affects the way that people drive and their comfort with precipitation will have certainly affect their ability to drive. I’ve written before about unexpected snow in Washington, DC, but I don’t think I’ve talked about one of the conversations I’ve had with someone who’s lived in Metro DC for over a decade. She was explaining to me that, not only do you have such a wide variety of drivers in the DC area (those who’ve moved from the South or those who’ve moved from the North or those who’ve moved from the West, etc. ), but you’ve also got the weather. More specifically, she was explaining that the “moderate” winters in DC make it awful for driving conditions. When the temperature hovers near freezing, the afternoon rain turns into morning ice. For those who have no experience driving in icy conditions, it can certainly cause drivers to be extra cautious (or mistakenly, not be cautious enough). 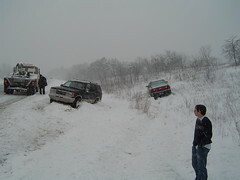 This is why I think it is important for any discussion of “the worst drivers” to include a weather variable. Sometimes, we need to be careful we’re not misappropriating the blame.